A friend of mine asked me what decent power bank I can recommend that she can order online, and I suggested get a Romoss. It is cheap yet well received by so many of its buyers. You can get one from Lazada, and have a guarantee that it is an authentic one. There are already a massive number of reviews from verified purchaser of this power bank. On this review, it is the Romoss Sense 6 Pixel Heart version with 20K mAh capacity. I let her choose which power bank she likes the most from all the Romoss power bank available. She opted for the Pixel Heart design. The delivery is fast, just 2 days later after the order, the power bank came in knocking at our doorsteps. It was 12-12 Online Revolution on Lazada when we ordered it, and we also used a discount voucher that day. It was definitely a “sulit” deal. Just like the Romoss Arrow 20 power bank, the box packaging is nothing fancy. Opening the box, it just contains the power bank, a micro USB cable, and an instructions booklet. There is also an authenticity sticker on the box with qr code that you can check online for a guarantee. There is a physical button on the side, pressing it will light up the LEDs indicating the current juice left on the power bank. The power bank is white, with matte finish feel. There is a pixelated heart print on it, thus why it was called Romoss Sense 6 Pixel Heart powerbank. There are 2 USB output ports. One with a 1A discharge and the other one is a faster charger at 2.1A current output. It has a micro USB as input for charging the brick. Nothing else, just your plain and simple power bank. The sides are reddish to the maroon shade. It is flat on its 2 side so you can make it stand. There are prints on the back with the specifications of this powerbank. A qr code of authenticity check is also present within the unit itself. I never had an issue with a Romoss powerbank. The ports are tight and doesnt seem to get loosed easily. It is compact and you can really feel that the battery inside are not just some cheap batteries from cheaper and low quality power banks. I am very much satisfied with the performance of my Romoss Arrow 20 powerbank, we can expect that this Pixel Heart version can sure deliver the same as well. If you are using mobile and uses the Lazada App, please use this link. 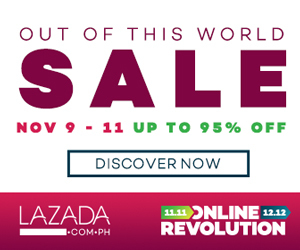 You can enjoy free shipping if your total order from Lazada hits P1000, and not just that, you can opt for a cash-on-delivery payment basis as well. Looking for a power bank for personal use or for a gift to someone else? I definitely recommend Romoss powerbanks.